What is a tea diet? At its core is the idea that if you consume tea, either in the form of a beverage or a supplement, you will lose weight. It may sound simple, but there are many potential pitfalls. As you read this article in detail, you will learn why consuming a "proven" tea product is important. Consuming green tea for weight loss has many advantages. Compared to other foods and beverages, it has one big advantage: it has been shown to raise energy and burn fat in many scientific studies. Every weight loss program advocates drinking lots of water, as it fills you until your next meal arrives. Drinking cup after cup of water can be boring, why not drinking tea instead? If you have a lot of weight to lose, just drinking tea is not enough. As you will see later, a well designed program to complement your tea diet is essential for maximum weight loss. Does it matter which tea I drink? It matters hugely what you drink. Scientists have discovered that the ingredients that are responsible for green tea's weight loss effects are catechins and caffeine. To reap the health and weight loss benefits of green tea, you have to consume catechin-rich tea or supplement. Only a quality tea will contain that much catechins. Never try to drink bucket loads of low quality tea, you will leave yourself susceptible to drinking too much. Tea research has consistently shown that the concentration of catechins and caffeine decreases with leaf age. 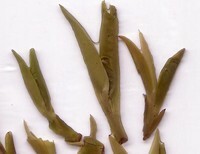 The youngest tea buds are harvested earliest in the spring. In East Asia, green tea is graded according to the timing of harvest; the earlier the harvest, the more expensive the tea. That is why when readers come to me for advise, I always recommend those AAA grades in my tea shop, as they are harvested in the first three days of spring. Considering the high quality, they can be surprisingly affordable as the leaves can be steeped or infused three times. They are naturally flavorful. Unlike supermarket teas, you don't have to add any sugar, lemon or honey. They taste subtly sweet with a light aroma, and energizes you with a calm, relaxing energy that can last for six hours or more. More importantly, they are highly potent and you need only a small amount each day. Being naturally organic, they are also very safe to drink. For a high quality loose-leaf, you only need to consume 3 - 6 grams a day. Infused for three times, they should give you 3 - 6 cups daily. The thing to remember is not to fall into the classic consumer trap of drinking lots of low quality products such as flavored teas, decaffeinated teas (unless CO2 decaf) or instant or bottled green teas. If you drink the wrong type of tea, you might need to drink 10 times as much to make up the difference! When is the best time to drink tea? Should I drink it before or after meals? How about before bed? Green tea is a very powerful herb. It is very important to drink tea at the right time to avoid unpleasant side effects such as gastric pains, nausea and insomnia. The best time to drink green tea is in-between meals and at least one hour after a meal. You should avoid drinking green tea on an empty stomach such as when it is the first thing in the morning. This is because green tea contains catechins and caffeine, both of which may stimulate the production of gastric acid and cause stomach indigestion. You should also avoid drinking green tea with meals as it can interfere with the absorption of protein, fat and dietary iron, the later especially important if you are menstruating or prone to anemia. Drinking green tea can energize your body for six hours or more. If you are sensitive to caffeine and prone to insomnia, you should avoid drinking tea in the late afternoon or at night. In summary, the best to drink green tea is one hour after breakfast and lunch and 30 minutes before exercise! Can I drink green tea with lemon and honey? Many readers from this site has reported significant weight loss drinking tea with lemon. While fresh lemon and unpasteurized honey is recommended, you should avoid using flavored tea as study has found them to contain just 40% of antioxidants found in regular tea. Can I drink green tea with ginseng or milk? Ginseng is an amazing herb but you should be using real ginseng, not a green tea bag that has been flavored with ginseng. Can I lose weight fast with green tea? What result can I see in the short term? That is pure inspiration and it is by no means one-off. Many people have told me how can lose weight quickly with green tea. However, not everyone will lose weigh quickly with green tea. For a more realistic view, check out this study by Dulloo and Rumpler used a state-of-the-art metabolic chamber to measure the energy expenditure of their study subjects over 24 hours. They found that green tea increases metabolism by 2.9% and 4% and fat burning by 12% and 35% respectively. Are rich tasting teas better for weight loss and health? According to a 2004 study conducted by the UK Institute of Food Research, high quality green tea is described as "delicate" or "sweet". The same study found that rich tasting tea contains the highest levels of catechins and caffeine - tea compounds chiefly responsible for green tea slimming effects. Which is better, freshly brewed green tea or dietary supplement? Would other teas have the same weight loss effect? Not all Camellia Sinensis has been proven to cause significant weight loss. Green tea is one. The other tea worth considering drinking is oolong tea. Other popular weight loss teas include Chinese diet tea, herbal laxative tea and hoodia tea. Click on the links below to find out why they are likely to disappoint. What is the secret to maximum weight loss? There is a lot more to permanent weight loss than green tea. Green tea keeps you in optimum health. It helps you achieve your goals more easily. It will complement any food and exercise program you choose to follow. What do successful weight loss stories have in common? In the following article, I have pulled together eight features of a successful diet plan. Which diet plan do you recommend? The National Weight Loss Registry tracks over 5,000 individuals who have lost significant amounts of weight and kept it off for long periods of time. An average registry member lost 66 pounds and kept it off for 5.5 years. 98% of participants modified their food intake in some way. 94% increased their physical activity. In other words, your best chance of maximum weight loss comes from following a well designed program that incorporates diet change and exercise. There are many weight loss and diet books around, but none of them is as comprehensively written as Tom Venuto's Burn the Fat. Burn The Fat Feed The Muscle - Who Should Read It? Knowledge is one thing. Motivation and follow-through is another. We often struggle to find time to prepare nutritious food and do regular exercise. A 2005 study conducted by Tufts-New England Medical Center concluded that the key to successful weight loss is not the diet itself, but actually following the diet! I was initially skeptical about weight loss hypnosis. But Enjoying Weight Loss by Dr. Roberta Temes is excellent. The 4 CDs are very relaxing and beneficial to listen to. How does green tea compare to a low carb diet, maple syrup diet and blood type diet? Ultimate Tea Diet - Does It Work? The Ultimate Tea Diet is probably the first best seller created by a fellow tea professional. I picked it up with much anticipation. It left me with mixed feelings. Mega Green Tea Diet Plan - Would You Do That? The Mega tea diet is a weight loss plan that consists of a green tea supplement, a low calorie diet and an exercise routine. The million dollars question is: how good is the plan? Super Tea Diet - Should You Play It Safe? Schiff has offered a decent product, but it is not herbicide free, which is my only concern. A sample green tea dieting meal plan recipe. The National Weight Control Registry. http://www.nwcr.ws.